Until January of this year, I was a regular customer of Comixology. As I've never been one to collect comic books as an investment, I quite liked the idea of a digital comic collection. I wouldn't have to buy bags and longboxes to prevent my comics from deteriorating, and I could carry my entire collection (or at least a significant portion of it) on my iPad. It wasn't long before I noticed something else that was different with digital comics: there was no way for me to share them with my friends. If I was telling my friend about a particularly good issue of The Tick, I could lend that issue to my friend so that he could share in my joy. If, however, I was telling my friend about a good issue of The Amory Wars, I had no such option. Over time, this came to bother me more and more. A particularly troubling thought was "What would happen to my digital comics if Comixology folded? If I'm completely dependent on Comixology for access to my digital comics, would I lose that access?" Digital Content is licensed, not sold, to you by comiXology. ComiXology reserves the right to revoke your license to Digital Content at any time for any reason. Translated into English, this states that Comixology never sold me any digital comics. What they sold me were rights to read said comics though their service - rights that could be revoked at any time and for any reason. If Comixology were to shut down, there's no reason to believe that I would retain any of these rights - my digital comics would simply vanish in a puff of illogic. Me giving up on @comixology is good for @phantomoakland - I'll be adding 19 titles to my pull list tomorrow. It didn't take long for my concerns to be proven correct. JManga, a digital comic service focused on Japanese comics, is shutting down. Their sales services are in mid-termination, and they plan to shut down entirely on May 30. All of the details can be found here. As of May 30th 2013 at 11:59pm (US Pacific Time) users will no longer be able to view digital manga content on JManga.com. At this time all purchased and free digital manga content will be erased from all JManga Member’s accounts. In other words, if you bought digital comics from JManga, they're bring taken away from you at the end of May. There will be no refunds, your money is simply gone. There is no legal way to retain or re-acquire the comics that these folks paid for. The seed was planted by Choose Your Own Adventure. The seed was watered by the Lone Wolf series. One December morning in the early 1990s, the seed bloomed. A few days after Xmas, I went to visit my neighbors, hoping to drink a couple (root) beers and trade the traditional "what did you get?" tales of the holiday just past. Seeing me at the door, Jeff said "Ooh, cool! Come in, we've got something to show you!" (all quotes are vague recollections at best.) I was led into the game room, where I saw what appeared to be a game board that was printed on a poster. Dungeons & Dragons had finally entered our lives. I chose the cleric character, and we settled in for what was to be the first of many afternoons around the gaming table. The adventure that afternoon was "Escape From Zanzer's Dungeon." It's a relatively simple adventure, designed in such a way that the players learn more of the game rules with each step. If you've ever played an Elder Scrolls or Fallout game, you know the sort of thing I'm talking about. We had a grand time, slaying hobgoblins, freeing slaves, and yes, Escaping From Zanazer's Dungeon. 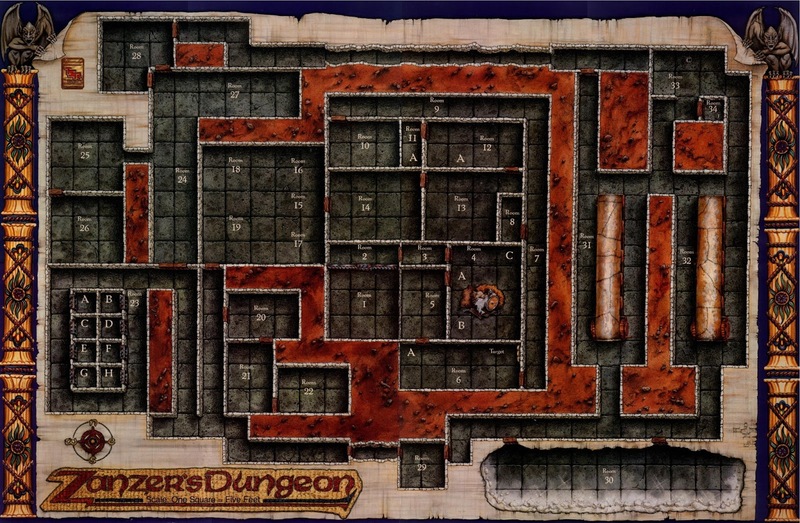 We were hooked, and we almost immediately started designing our own dungeons to delight and torture one another. Before long, we progressed to Advanced Dungeons & Dragons (2nd Edition) and found ourselves adventuring across Krynn, Faerun, Athas, and countless other fantastic lands. Unfortunately, as is often the case, "real life" moved our fantasy adventures first to the back burner, then into the back of the pantry. When WotC released Dungeons & Dragons Third Edition, I merely watched from the sidelines. In 2010, we finally managed to re-form our little gaming group, with a few new players for good measure. We took Third Edition for a spin (it's quite good), weathered a shift in membership, and eventually shifted to board games as a result of DM fatigue. We remained in board game mode for a few months until an idea hit me. Because we never had much available cash for gaming, we had always played homebrewed adventures. As such, we'd never played any of the "classic" adventures of yore - the ones that are so fondly reminisced about in game shoppes worldwide. Now that I can get my hands on some of those classic adventures, maybe I should take the group back to our Second Edition roots and play some of these classic modules! After abut a month of preparation, on March 1, 2013, we returned to the Forgotten Realms in all its early Second Edition glory. 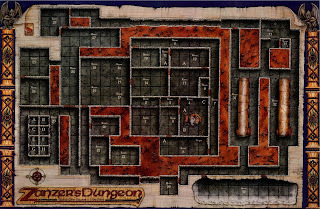 In a tribute to our gaming roots, I've re-tooled Zanzer's Dungeon for use with AD&D Second Edition rules and placed it in the foothills of Tilver's Gap. By Clangeddin's beard, it feels good to be back.